I’m not a newlywed anymore, (and honestly, I did not cook like this ten years ago…) but I was intrigued as soon as I found this recipe online. I figured that if this book had awesomeness between its covers like this, it would certainly be worth borrowing from the library 🙂 Up until a couple of weeks ago, I had no idea that this kind of cookies existed. 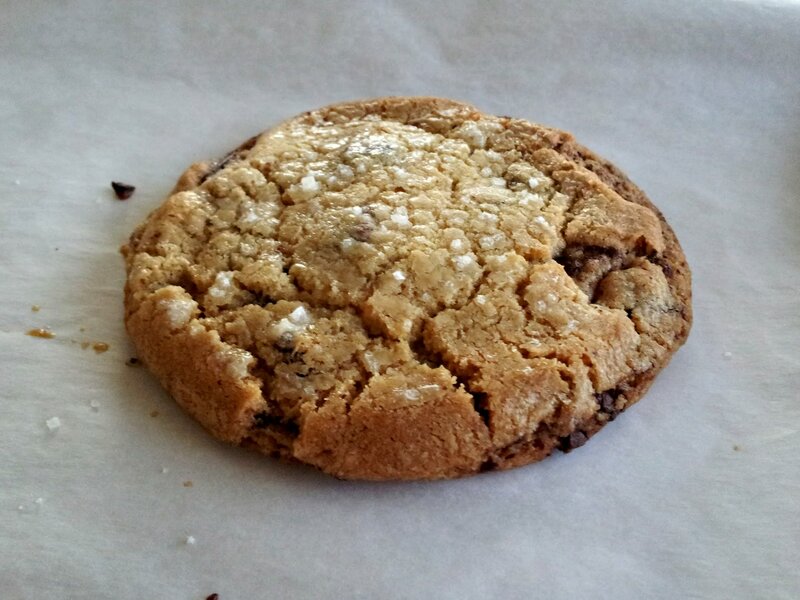 This website has great pictures of step by step of how these amazing cookies are created and they’re worth the extra effort! 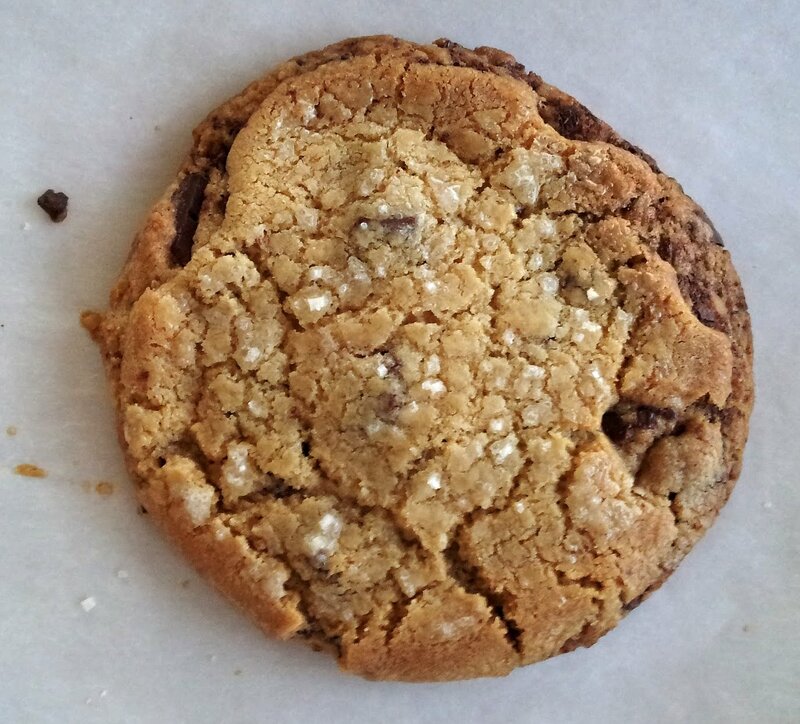 I love that the chopped chocolate instead of chips because you get chocolate in every single bite – powder, shards and chunks all in one awesome cookie. They bake up slightly crisp but chewy in the centers; and the flaky fleur de sel leaves a pleasant, salty zing on your tongue. I have never used that salt until today, but I can’t wait to use it in other recipes to see what the fuss is all about. These are the best chocolate chip cookies I have ever had. Period. End of story. Thanks for reading, enjoy! Preheat oven to 375 degrees. Line two baking sheets with parchment paper; set aside. In the bowl of an electric mixer fitted with the paddle attachment, cream together butter and both sugars on medium-high speed until light and fluffy, about 3 minutes. Beat in egg yolks, two at a time; add vanilla and mix to combine. In a large bowl, whisk together flour, baking soda, and salt. With the mixer on low, add flour mixture; mix until just combined. Scrape down sides of bowl and mix to combine. Divide dough into three equal portions. Wrap each portion with plastic wrap and transfer to refrigerator; let chill for 30 minutes. Meanwhile, using a serrated knife, coarsely chop chocolate into thin shards. Set aside. Unwrap one portion of chilled dough and place on a lightly floured work surface. Sprinkle with half the chocolate and top with a second portion of chilled dough. Sprinkle with remaining chocolate and top with remaining portion of dough. Lightly dust with flour and gently roll out dough to a 9-by-6-inch rectangle, about 1 1/2 inches thick. Using a 2-inch-round cutter, cut out 10 rounds of dough. Gather scraps and lightly pat into another 1 1/2-inch-thick rectangle and cut out remaining cookies. Place on prepared baking sheets about 3 inches apart and brush with beaten egg. Sprinkle with fleur de sel, if desired. Transfer cookies to oven and bake until cookies are set, 12 to 15 minutes, switching baking sheets from top to bottom halfway through baking. Let cookies cool slightly on baking sheets, about 3 minutes, before transferring to a wire rack to cool completely. Cookies can be stored in an airtight container for up to 4 days. Practice makes perfect 😉 I hope you decide to try these! looks like the perfect cookie! I want this right now!! Wow. I bet the salt with the sweet really intensifies the flavors.